The Twin in Berlin: DIRNDLS ARE HERE, Performing In Front Of A Small Mass Of Missionaries & Men Are That They May Have Joy. DIRNDLS ARE HERE, Performing In Front Of A Small Mass Of Missionaries & Men Are That They May Have Joy. That alone is a sign that the time is flying. Ok, it is only July, but already there are dirndl and lederhosen appearing. Oktoberfest is still far away, but slooooowly approaching. Haha across from the institute center here in the city there is a "T.K Max, aka the German version of T.J. Max in the states. 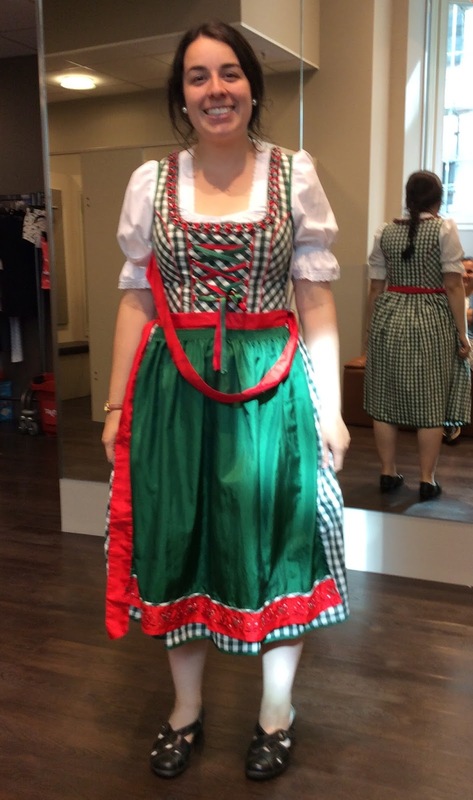 So of course in Germany you can just buy a dirndl at TK Max like it's no big deal. I tried some on this morning!! I love Germany! So the best part of the week was probably Thursday, our zone conference WITH PRESIDENT FINGERLE. It was here in Leipzig. We were all just sittin there chillin and then he walked in with his wife and some kids. GEHT'S LOS. His son is a recent RM, and the two of his four daughters they are 16 and 9. That alone was really different. But I love them already! They are gentle and strong in the spirit. It was so fun learning about them and just hearing form them! It was an awesome meeting. And it was all in German!!! I loved that part. They are really focused on the family, and getting people soon to the temple after baptism. I am down! Oh man, it was a great day. Good times were had by all. Soooo we performed again what we did in church two weeks ago. Elder Clarke on piano, Sister Reed on violin, and then I sang with an Elder in my zone. We really only practiced all together for about 20 minutes before we had to be sitting down, but it was cool. We went at the beginning thank goodness. mensch it was already nerve wracking performing in front of a small mass of missionaries, but then standing right in front of my new Mission President made it that much better! haha it was gooooooood. The spirit was there to calm my voice, and to touch the hearts of those there. Something else President and Sister Fingerle talked about was making 1% changes in our work and habits. We can't expect to change overnight, but great change will come over time with small degrees of change right now. They referenced that talk by President Uchtdorf, in which he talked about the planes and changing their direction by only a few degrees, then getting way off down the journey as a result. This piece of advice was an answer to my prayers this week. Recently I have been feeling like I just need to be different in so many aspects of my missionary life. I just want to be better, but of course when one takes on the task to be a "new me" frustration will come when one fails the first few times. But you know what, that's not how we change. As we make small changes, slowly but surely the progress will come. Nobody wants to hear that, I personally want to be different NOW. But this week I realized that the success comes in the progress, not just with a finished product, so to say. Although I may not be where I want to be, I can still be successful and effective on the way. I encourage you all to think about that and apply it to YOUR personal journey to becoming the best you. 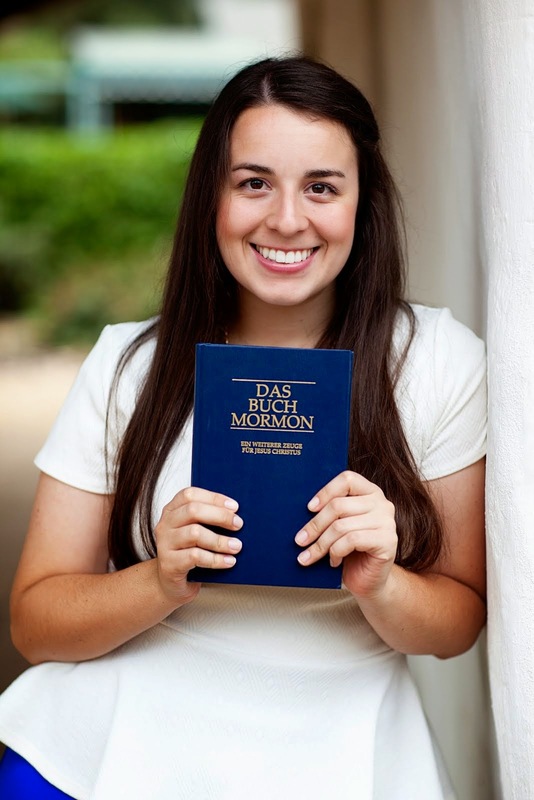 Sister Reed is doing well. We laugh and get along just great. I love serving with her. She is pretty sassy which is always a good thing. We have good times talking about everything. She always has a lot to share in comp study, haha I could listen to her all morning. I really hope we can stay together for a few transfers more!! Also she is a PROFI on her violin. Like for real. She is talented. So I had been feeling a bit lost for a few days in all my thoughts and was just searching for some direction. My morning studies were going well but I still felt a bit off. Sister Reed one morning said something about her wanting a Priesthood blessing, and in that moment it just clicked in my head! I needed a blessing. So later that day sweet Elder Clarke (man still so hard not saying Jacob!!) gave us both a blessing. This week I had also been reading in first Nephi about the Liahona. It was a little ball for goodness sake, but because the people believed it would guide them, it had the power to bring them counsel and direction straight from Heavenly Father. I compare this with the blessing. I didn't need an angel to come out of heaven or anything, but when my little (well not so little but sometimes it still feels like that) 19 year old neighbor put his hands on my head, I KNEW and I FELT that through his voice I was receiving counsel straight from my Father in Heaven. That was such a spiritual moment for me, my worries were calmed and my direction became clear. How grateful I am that through small and simple means, the Lord can bring forth miracles in my life. I am also grateful of course for our worthy elders who willingly and happily serve us. I love this city more and more every day. Time is going by faster than ever, but I am really trying to enjoy every single moment. "...men are that they may have joy." we can endure and be happy at the same time! I know it. I know God lives. I know Jesus is our Savior and Redeemer.